A most unique Tillandsia decorates the rocky boulders which slope right down to the water's edge on the ocean front not far from the city of Rio de Janeiro in Brazil. It bathes, daily, on sun and salt air and lazily crawls over the granite rocks, stopping every spring to express its gratitude in short spikes of delicately colored pink and white flowers. Sending out a few hold-fast roots every now and then this Tillandsia seems to grow on and on, endlessly. Unlike a centipede that must use its legs over and over again, this plant can develop new ones continuously and leave the old and useless ones behind. In 1939, on our first visit to Brazil's ocean front near Rio, Racine and I were quite excited when we first saw and found this plant with its incredible growth. We brought a few "strands" back with us six months later, and, as the photo on the cover shows, it is still growing for us in the Bromelario, unattached but festooned on a Florida Taxodium (Cypress) tree. Without its native granite rock, salt air or direct rays of the sun, it still thrives; after sixteen years it is a beautiful sight to behold. Some of the strands are four and five feet long. And, while it puts out a few roots at each year's growth, they seem perfectly satisfied not to be attached to anything so long as the main plant is securely suspended. This species, T. Araujei, is certainly as much of an "air plant" as is "Spanish Moss." The Index to the first five years of The Bromeliad Bulletin is in the final stages of completion. For those whose memberships expired in December–this will be their last issue. We need the concerted effort of every member to pay his dues so that the Society may carry on its work. 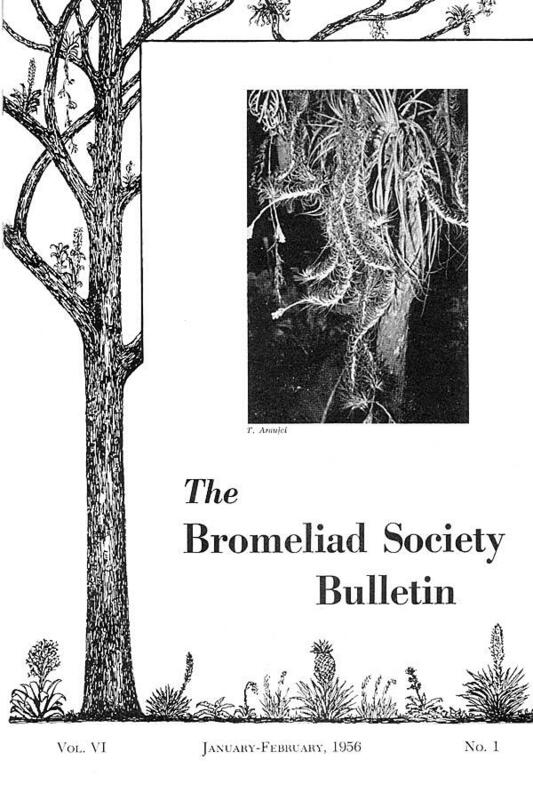 Please, be reminded that there are no paid officers or assistants in The Bromeliad Society, and that the majority of the work in making this Bulletin possible, falls on the hands and time of a very few persons. These few persons are endowed with the love of bromeliads but have no financial endowment. It is up to the members of the Society to keep this Society alive; we sincerely hope that every one will make some effort to procure new members. We do not have the funds for an advertising campaign to do this. More members and more contributors, please. It is our only means of carrying on. Most periodicals, as you know, are carried financially by their advertisements. This is a very small item in the support of The Bromeliad Bulletin. Let's really make an effort to build up the membership of the Society. It is up to each of the individual members. Fig. I: Twigs from Juniperus with fresh seeds from Tillandsias wrapped around before moistening. Fig. II: A piece from a five year old cultivation of Tillandsia butzii. The wood is rotten and broken. For more than 20 years I have tried to cultivate Tillandsias from seeds. I experienced many failures. Other bromeliad-friends, who take delight in these particularly peculiar plants, have perhaps also failed. Therefore I want to tell you how I finally succeeded by creating natural conditions similar to those which the Tillandsias enjoy in the native habitat. Usually it is easy to obtain seeds by pollinating. They must ripen well until the capsules open by themselves. The seeds should be kept dry and they should be mixed so that they form a ball like fine wool, ready to fly away at the slightest breeze. Now you take fresh, ramified branches of irregular growth and of hard wood with a firm bark (wood of Ericacea, Crateagus, Conifera). Take pieces of 1' to 1½' in length and remove all leaves and needles. Then, with the ball of seeds move over the branches so that the seeds cling to the bark of the branches, about 8-12 seeds per inch. Then wind some thread of wool, silk or nylon around the branches to fasten the seeds which are not attached satisfactorily. There is no need to wind the thread too narrow. (see fig I) Now hang up the branches upside down and sprinkle them at first carefully and then more vigorously with water. By now all seeds with their hygrophile wool will cling to the branches and the grains come in contact with the wood of the branches. Finally the branches with the seeds can be dipped into water and moved about a bit, so that the seeds may cling tighter to the branches. Hardly a seed will become detached. This ends the sowing. Fig. III: Tillandsia Schiedeana in its thirteenth year. Two years later the plants came into bloom. They were placed on new wood five times. Then it is important to find a suitable place in the hot house, not too sunny, not too shady and not near the radiator. A place above a water basin would be ideal. The branches there can easily be dipped into the water–and this has to be done quite frequently! The spot where the Tillandsia usneoides grows well also proved to be particularly suitable for the Tillandsia seedlings. If possible, sowings with other species should be repeated. Gather the branches with the seeds in small bundles which simplifies the dipping or the sprinkling and provides more shade and dampness. In summer it is necessary to water them 2-3 times daily, but in-between they should become dry again. In winter they should be kept dry. One has to observe their need for water. The sprouting is quick and can be noted after one week already by the swelling of the seeds. One will have to be satisfied if two or three small leaves have grown by the end of the first summer. Impatient people should grow salad instead! It will often be noted that not all seed grow equally well: some seeds grow better on dry spots, others on moist spots. For this reason it is good if the branches are irregular in growth and if they are crooked. Somewhere there may be the chance that the seeds find the conditions most suitable for them. The seeds will also grow on bark. At first this works quite well, but if the bark happens to get too hot in the sun everything will burn. Green wood will never become as hot as dead and dry bark. This is another reason why branches which are too thick should not be considered. After 2 or 3 years the branches will look very pretty. They will be covered completely by seedlings and appear like a branch of a larch tree with needles. Unfortunately, even the best wood will be rotten by that time, and the branch crumbles easily (see fig. II). The branches will have to be cut or the seedlings will have to be taken off and planted on new wood. The further cultivation will not be difficult any more from then on. 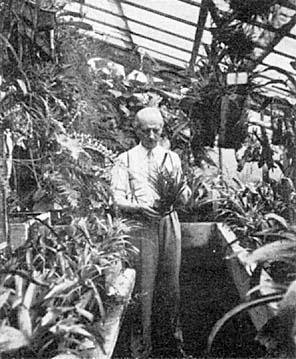 Dr. Richard Oeser in his home greenhouse. Employing this method I grew thousands of seedlings from a dozen types of xerophytic Tillandsias. But, alas, they all fell a prey to the last war. Some of them I had given to friends and they were returned to me, like the Tillandsia Schiedeana (formerly called vestita) which was 13 years old when this picture was taken (see fig. III). It bloomed the first time in the 15th year. Tillandsia polytrichioides bloomed after three to four years. By cultivating the seeds in this manner a beautiful cushion of plants is obtained. This method is of advantage because only the Tillandsias grow but not the undesirable moss, except when they are kept too moist. Therefore no need exists to replant them before a period of three to four years. One has to have patience. I should like to know how much time the wildly growing xerophytic Tillandsias require from the seeds to the blooming. It is necessary to be most careful if fertilizer is used. In most cases branches and seeds become covered by green algae which badly affects the growth. Tillandsias with soft Vriesia-like leaves should better be cultivated as described in the Bulletin for Vriesia and Guzmania. However, the seeds of the xerophytic Tillandsias need the change of moisture and require a lot of fresh air. They are extremely sensitive to fungi which are created by constant moisture and lack of air. An attempt to cultivate them in a sterile culture like the Vriesias or orchids will probably be successful. I have recently tried to grow Tillandsia seeds on plastic tissues. It is possible but on the branches it looks much nicer and more natural. 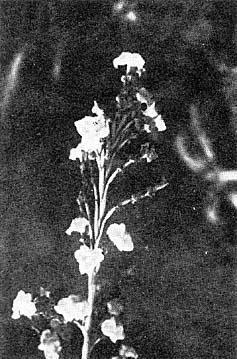 Photographed by Albert E. Vatter, Jr. from a living plant in Guatemala collected by the authors. 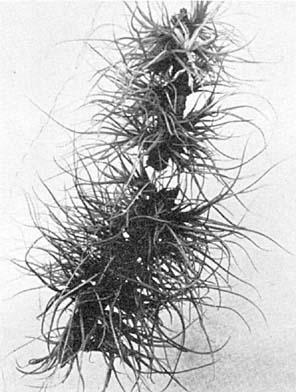 One of the most unusual species of the large genus, Tillandsia, is T. Standleyi. This was first described in 1931 by Dr. Lyman B. Smith (Contr. Gray Herb. 95: 46), and was based upon a specimen collected by Paul C. Standley from El Achote, near Siguatepeque, Honduras, on February 18, 1928. Mr. Standley found the plant growing as an epiphyte on an oak tree at an elevation of 1,500 meters. This species may be easily distinguished at once from all other members of the genus by the meter long, gracefully pendent inflorescence bearing long, prominent, primary bracts. Dr. Smith states (loc. cit. 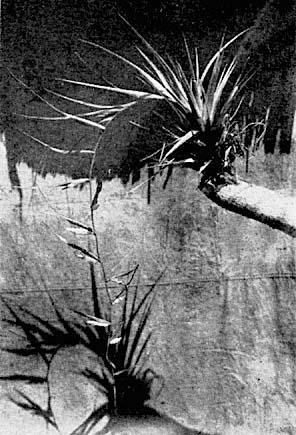 p. 47) "Unlike any other species of Tillandsia known to the writer, T. Standleyi has a peculiar growth at the base of each spike on the side toward the axis of the inflorescence (P1. IX, figs. 1-2). Various facts would indicate that this growth functions as an aid to spreading the spikes at maturity. The deep groove left in the basal floral bract which is next the axis (Pl. IX, fig. 4) and the total absence of any groove in the one on the opposite side indicate that before maturity the spikes were erect and very closely appressed to the axis. The extremely shrunken condition of the growth indicates that it was formerly very turgid, and this with its spreading position evidently made it well adapted to pushing the spike away from the axis of the inflorescence. It is not possible to ascertain the morphological nature of this growth with any certainty until fresh material is obtainable." Tillandsia Standleyi was known only from the original Honduran collection until it was later discovered in Guatemala where Mr. Standley and the present authors found it on respective expeditions made to that country sponsored by the Chicago Natural History Museum to collect material for the Flora of Guatemala. Here it is found in the mountains in two eastern departments of that republic: Zacapa and Alta Verapaz. In the department of Alta Verapaz it occurs as an epiphyte on trees in a large swamp near Tactic at an altitude of 1,450 meters, associated with such other bromeliads as Catopsis Hahnii Baker and Tillandsia Ghiesbreghtii Baker. This region lies in a zone of wet, diversified forest. In the department of Zacapa Tillandsia Standleyi is found in mixed oak-pine forests of the Sierra de las Minas at elevations ranging from 1,450 to 1,500 meters. These forests are situated in the zone of clouds where the climate remains fairly cool and moist with rather uniform temperatures averaging 60-65° F. throughout the year. There in these oak-pine cloud forests T. Standleyi is found as an epiphyte along mountain slopes associated with another Tillandsia, T. lampropoda L. B. Smith. Some of the small trees and shrubs of this forest consist of Styrax argenteus Presl, Vaccinium poasanum D. Sm., Befaria mexicana Benth., Ilex quercetorum I. M. Johnston, and Gaultheria odorata Willd. Tillandsia Standleyi is a striking plant when seen growing. The drooping spray of flowers thus appears to dangle in the air from the lower part of a tree, like some plant from a hanging garden. The long curving inflorescence with its prominent bright red bracts placed almost horizontally at right angles to the vertically descending elongated axis of the inflorescence arises from the center of a leaf rosette. The peduncle is scarlet. The bracts of the peduncle have a deep red color and become dull purplish on the outside near the tip. The violet petals, measuring 5 cm. long, white filaments, and yellow anthers add a striking contrast against the red peduncles and primary bracts. The erect to ascending leaves are rather stiff and are dull green on both sides with purple-brown near the base. In addition to the original locality where Standley discovered the species in Honduras, it has, in recent years, been collected in Honduras from cloud forests on Cerro de Uyuca in the department of Morazan and from the Montana de Yuscaran in the department of El Paraiso at elevations ranging from 1,300 to 1,800 meters. Living plants of T. Standleyi were brought back from Guatemala by the senior author to the United States in 1942, where they were grown at the Lincoln Park Conservatory in Chicago. These plants never flowered and subsequently died, so that, so far as known, no living plants of this species are extant in this country. It is to be hoped that such a showy ornamental plant may eventually find its place in homes and conservatories along with other beautiful bromeliads. Chicago Natural History Museum, Chicago, Ill.
Tillandsia cyanea as it grows wild in Manabi, Ecuador. It is now close to seven months that I have roamed Latin America for orchids, during which time I have seen and passed literally millions of bromeliads, many of which I have grown to hate because of their notorious habit to topple over when one climbs a tree for an orchid, thus giving you many an involuntary bath. These I call the "Green Buckets." Other ones, the terrestrials, penetrate one's pants with sharp spines while crossing the savannas and, in general, bromeliads occur throughout tropical America with the abundance of weeds. Smaller varieties with more highly colorful spikes are less frequent. I recall vividly, having admired a most marvelous bromeliad between. Tegucigalpa and the CEIBA property in Honduras; a real weird and obviously rare species which grows near Altaquer (Dept. of Narino) in southwestern Colombia in precisely the vicinity where one also finds the rare orchid Pescatorea Lehmanni, with a zebra-striped Vriesia (?) north of the Valle de Anton in Panama (Province of Coclé). But if you are specializing in orchids and don't know of any book in existence to help identify your finds, you are bound to lose the interest in bromeliads to a certain extent. That is . . . until you once again run into a real gem, such as this plant which I believe to be Tillandsia cyanea and known to be endemic to Ecuador. I have traveled the country's four corners, but found this species only in a very limited section along the Pacific coast where it spreads from the Cordillera de Colonche into southern Manabi. Unlike all other bromeliads, Tillandsia cyanea, cannot just be "picked it requires a real back-country expedition to be located and carried back into what South Americans call civilization. A certain "highway" runs close to the place and this is why I asked my friend to call his driver and use his Packard for transportation. The tire burst three times on the way north to the boundary of the province of Guayas. Actually there is no road, but a spider web of desert tracks with potholes of three feet depth which made us lose our direction several times as each singular driver to tackle this region crosses the country on pure instinct. There are no bridges, but several rivers in the center of one of which we got thoroughly stuck with the motor completely drowned at four A.M. By six A.M. we had pushed the car out while standing in the muddy water to the height of our hips. A day passed and we were ready to leave again. An hour later we rolled over into a cactus studded ditch. The driver was getting nervous by now–but it did not save him from running the car into a sand dune next! By the time we hit Manabi the lower middle section of the car was thoroughly ground off, as the tire tracks of the inter-provincial trucks to pass through this country are way too deep for a passenger car. Then there was a genuine blowout" and before we knew what had happened the steering wheel spun around like mad. It had broken from its connection. This did it! There was no other car or truck for twenty-four hours which we spent eating green bananas, wild papayas and killing mosquitos. Neither houses nor villages are near, instead the forests are full of huge Bushmaster snakes, three-inch spiders, hords of ants, butterflies and humming birds. Night fell and with it came the spine curdling noise of the howler monkeys. The morning showed fresh Jaguar tracks only thirty feet distant from the car. There was nothing we could do but grab machete, pistol and walk several hours into the jungle which is rather dense here and there with open, park-like stretches in between. Housing the trees here are Catasetum, Cattleya maxima orchids and the stunning Tillandsia cyanea which grows locally by the hundreds. We returned with a good thousand plants, although the car still lies broken down on some odd track in northern Guayas. This story gives you some idea of the difficulties in obtaining bromeliads and it may justify a good price. Take my word that it is not exaggerated. Now–to the plant itself: Tillandsia cyanea always grows in the tops of trees or shrubs where it receives plenty of light, partly, even, the full sun-blast of the equatorial sky. Those plants which have fallen down from the branches thrive by rooting in the layer of dead foliage of the forest floor, but unfortunately are often attacked by an insect larva and so perish. Also, down here they rarely ever carry flowers. The root system of arboreal plants is poor. 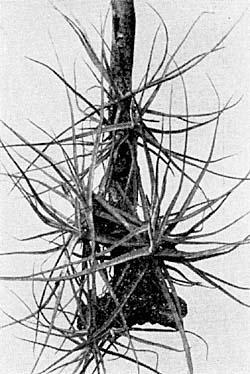 In most instances a few roots attach the plant to the stem, after which the growing rhizome literally winds around the supporting branch or stem, finally resembling the spring of a watch. The heat in this district is absolutely suffocating, although the Pacific lies hardly six kilometers distant. Oddly enough, the climatic seasons here are entirely reversed to the rest of Ecuador; January to June are the dry months while July to December the heavy rains pour down making all traffic and communications, which, even during the dry season are so utterly poor, become completely impossible. 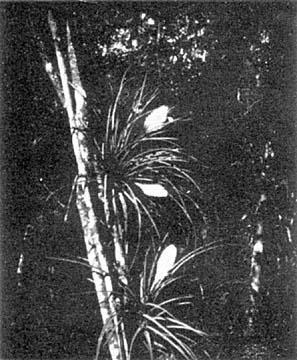 I am still an orchid hunter, but thought readers of the Bromeliad Bulletin might be interested to learn about the native haunts of Tillandsia cyanea. 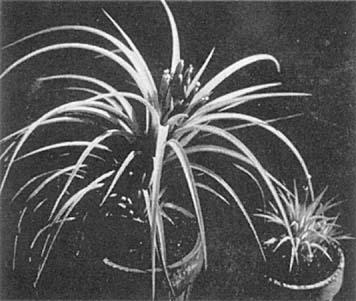 Tillandsia × Victoria on left with its maternal parent, T. ionantha, shown on the right. Tillandsia × Victoria M. B. Foster hyb. nov. This new hybrid was made in March 1943; it matured and flowered for the first time in 1954. In all its characters it resembles a king-size T. ionantha and shows none of the features of its paternal plant T. brachycaulos, except that it has a slight trace of a scape, although it is not visible nor evident as in T. brachycaulos. In every other feature, however, it is just a giant sized T. ionantha. In flower this new hybrid measures from five to six inches to the top of its flowers. All the leaves turn to a luscious cerise pink crowned with its many purple "candle" flowers in the center. Few Tillandsias, when in flower, command any greater admiration than T. ionantha; multiply this display many times and you have T. × Victoria in all its glory. There are few records of Tillandsia hybrids. Principally, I feel sure, because of the long lapse of time between the date when the cross is made until the final maturity of the new hybrid; I doubt if this waiting period is rarely less than ten years and with some species it could be fifteen to twenty years. This was my first success in hybridizing Tillandsias, so, it is with much pleasure that this new hybrid, Tillandsia × Victoria is named in honor of Miss Victoria Padilla, the enthusiastic and indispensable secretary of The Bromeliad Society. This model reproduction is part of the synoptic exhibit of families of flowering plants in the Hall of Plant Life in the Chicago Natural History Museum, Chicago, Ill.
Because of frequent variations in plant structure, form and texture, the preparation of realistic models for botanical exhibits has become a more or less involved technique. Among the variety of materials used in the process, such mediums as glass, wax, celluloid and other newer plastics are usually employed in reproducing leaves, buds, and flowers, etc. The forming or casting of the various parts may be obtained through the use of molds, dies, or by hand modeling. The entire procedure is quite slow and laborious, suited only where accurate reproductions are desired. 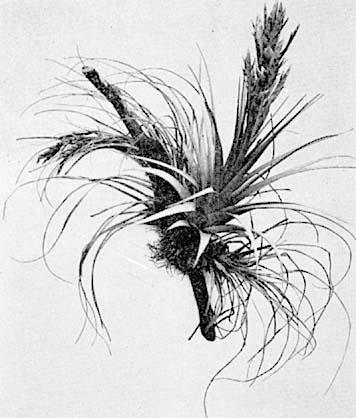 For instance, the preliminary preparations for the model of Tillandsia fasciculata as shown, included besides the necessary photographs and color notes, a series of about a dozen plaster molds of selected leaves and flower bracts from the original plant. Each of these molds were later used as patterns for the metal dies, which were necessary, in order to cast the plastic leaf models under pressure and heat. After the leaf casts were made they had to be trimmed and later colored. This required several coats of oil color applied with an air brush, all the spots and blemishes painted by hand. The finished leaves were then faintly covered with a final coating of bloom. The small but showy purple flowers of the Tillandsia with their definitely visible stamens were reproduced in glass. On a blue flame gas torch, rods were drawn down to the tiny stamen's natural size and each topped with two pollen-sacs welded to the filament. Six of these stamens were then fused at the base surrounding a similar glass rod shaped to represent the pistil. The rolled petals also of glass, preformed and colored, were then slipped over the stamens and cemented together. This type of minute work, usually done by hand, demands constant attention to form, size and proportions. After all these individual operations, came the important task of assembling, fitting and carefully fastening all the various parts in their proper places and sequence. All this in a manner which would not readily reveal itself at close inspection and yet retain for the model a growing or natural appearance. With an occasional last minute adjustment here or there and the final attachment of the model to its original supporting branch, the Tillandsia was considered completed, with a hope that future Museum visitors with their comments and acceptance would justify the time and efforts invested. This Tillandsia, lacking in the usual composure of most bromeliad urn-shaped forms, has been given its specific name because of this decomposed characteristic. It is a rootless plant surviving in Mato Grosso, Brazil, and neighboring countries to the south, by clinging with its corkscrew and wiry leaves to the tree branches. It continues to put out a succession of new leaves, each one taking the responsibility to curl and twist around a twig, the better to hold itself in the tree. Year after year the plant continues its growth and sends its flower spike out from the center only to be pushed aside as the new continuous growth forms its twisted main body. In bloom, the flower stem is sometimes two feet in length, holding many exquisitely fragrant lavender flowers. There are, possibly, more species of Tillandsias carrying fragrance than those of any other genus in the Bromeliaceae, at least of the bromeliad species that bloom in the light-hours of the day. Tillandsias also have a habit of retaining their individual flowers over a much longer period of time than the majority of bromels. Few bromeliads retain their flowers in good condition more than twenty-four hours but many of the xerophytic Tillandsia species hold their blooms in good condition from three to five days, and it is some of these species, which retain their perfume, that we wish to mention in this paper. Most of the outstanding odoriferous species are xerophytic in habitat, such as T. decomposita, T. Duratii × T. tucumanensis, T. streptocarpa, T. crocata, T. xiphioides and, of course, T. usneoides, as well as others, Nearly all of them give off an exquisite scent every hour throughout the day as well as at night. All of these species are at home in the southern countries of South America, such as Argentina, Paraguay, Bolivia, Uruguay and southern Brazil. As to flowers, the above species have lavender or purple petals except T. crocata which has yellow petals, T. usneoides which has yellowish-green petals, and T. xiphioides which has chaste white petals. Incidentally, these fragrant Tillandsias have flowers with spreading petals and do not have the close, tubular formed ones with narrow petals that overlap, as the majority of Tillandsias have. Considering the plant contour, we observe that the majority of all the bromeliads are relatively symmetrically formal or well-composed in their shapes. However, a number of the fragrant species seem to be quite lacking in symmetry, or as the botanist would say they are "decomposed," being almost grotesque in form. The best examples of this characteristic are T. decomposita, T Duratii and T. tucumanensis all of which have heavily lepidote (scaly) curled leaves and twisted stems making the plants attractively distinct in form. They have roots only during their early (juvenile) stages and later they hold fast to the tree branches by their tightly curled, clinging leaves. Thus, they can adapt themselves to harsh, xerophytic conditions on scrubby shrubs or cacti and on rocks. T. usneoides, for example, has been seen to hang from edges of palisades-like rocks (near Bogota, Colombia) in great sixty foot tresses, a phenomenon of adaptation as well as an example of the continuously self-elongating habit. This Tillandsia is remarkable in more ways than one. 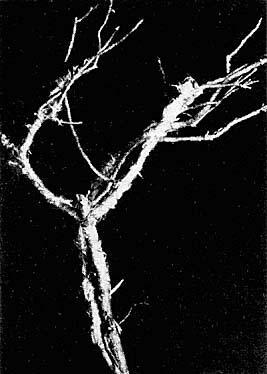 It may surprise the objective observer who does not go around smelling of every flower he sees, that the commonest of all the Tillandsias, T. usneoides (Spanish Moss) disseminates from its single tiny and fragile greenish flower, one of the most elusive and delicate of fragrances between the hours of "first dark" and midnight. Perhaps only a few curious persons who, wandering under the Spanish Moss and experiencing this soft spring-night fragrance permeating the air on a March or April night, have traced it to its origin. In fact, the majority of folks are unaware that this fantastic bromeliad even "wears" a flower, much less one that "breathes" a perfume which any parfumeur would want to capture in a bottle. Since this perfume is released only at night there is, undoubtedly, a night moth which, attracted by the sweet essence, gathers the nectar and inadvertently pollinates the flowers. Although few enemies, outside of man, have been found which attack this Tillandsia, a tiny grey caterpillar, which resembles a section of the moss itself, has been observed on the moss; only the sharpest eye will detect it. Perhaps it is the mature moth of this caterpillar which seeks the night nectar when the fragrance is at its height. There are, no doubt, many more fragrant Tillandsias than those we have mentioned, as well as species of other genera that offer a fragrance, so let's stick our nose a bit farther into this subject! The genus Tillandsia is the largest and most widespread of all the genera in the bromeliad family. More than four hundred species are known to be native throughout North and South America and nearly one third of them are native to North America. The plants may vary in height from one half inch to twelve and fourteen feet; some are small rosettes, some are large urn-shaped plants, or they may be rather bulbous in form. The compact and rosette forms are generally small and often have twisted leaves. The flat leaf types which are generally smooth, if shade loving, or growing in moist, high locations, are usually the larger plants. Tillandsia belongs in the subfamily Tillandsioideae; all of them have fruits composed of three carpels which are dry at maturity and burst open to release their seeds. The seeds are narrowly cylindric with a plumose appendage which is straight at maturity. Seeds are carried by air as on a parachute. The leaves are always entire (smooth edged), and are either glabrous (smooth) or lepidote (fuzzy). Most of the dry climate or tree-top species are covered with tomentose scales, whereas those in a moister climate have a smoother and broader leaf. The petals are naked (no nectar scales at base) and are free (not joined to each other near base). The flowers usually appear on one or more distichous (arranged in two rows) spikes but rarely simple (one row) or polystichous (many rows) and even one flowered as in T. usneoides. In habitat most of the species are epiphytic but many of the larger species are terrestrial or saxicolous. Many species of Tillandsias and Vriesias may appear to look so much alike that they could easily be confused. The one salient feature which is most evident and easily determined is the absence of nectar scales at the base of the petals of Tillandsias and the presence of such scales on the Vriesias. The xerophytic Tillandsias, heavily covered with tomentose scales, are rarely confused with Vriesias. However, some of the more glabrous (smooth) and flat leaf types of Tillandsias may he confused with Vriesias if the petals are not examined. If the layman feels that the present day Latin names of plants are difficult to remember, he should try to memorize the first Latin names that were attached to our common Spanish Moss which we now know as Tillandsia usneoides. The first attempt at a scientific name was made by Piso et Marcgr. in the National History of Brasil in 1648, and they called it Camanbaya Brasiliensibus. In 1696, when Sloane found it in Jamaica, he named it Viscum caryophylloides teniussimum. Also, in the same year, in the Pluk.-Almag. 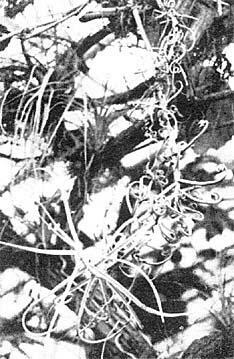 1696, it was called Cuscuta ramis arborum innascens. Since these early dates this strange and ubiquitous bromeliad has been scientifically listed under at least twenty-three different names such as: Renealma, Dendropogan, Phytarrhiza, Fucus, Rhizomorpha, Oldsmans, Strepsia.